Allergen Information: Contains Wheat Gluten, Egg, Peanut Products. This food factory also handles cereals containing gluten, egg, peanut, sesame, soybean, milk, crustacean, tree nuts and nut products. Please keep in a cool and dry place (preferably in a refrigerator). 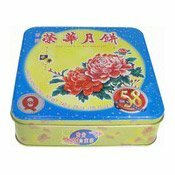 Ingredients: White Lotus Seed Paste (Sugar, Lotus Seed, Water, Peanut Oil) (68%), Duck Egg (16%), Wheat Flour, Sugar, Peanut Oil, Salt, Raising Agent (E501). Simply enter your details below and we will send you an e-mail when “White Lotus Double Yolk Mooncake (榮華雙黃白蓮蓉月餅)” is back in stock!